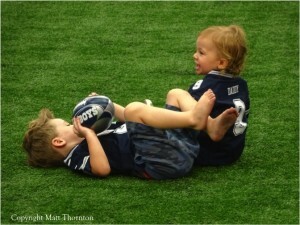 The Dallas Cowboys wrapped up their final day of mandatory minicamp on “Family Day” at AT&T Stadium in Arlington, Texas. 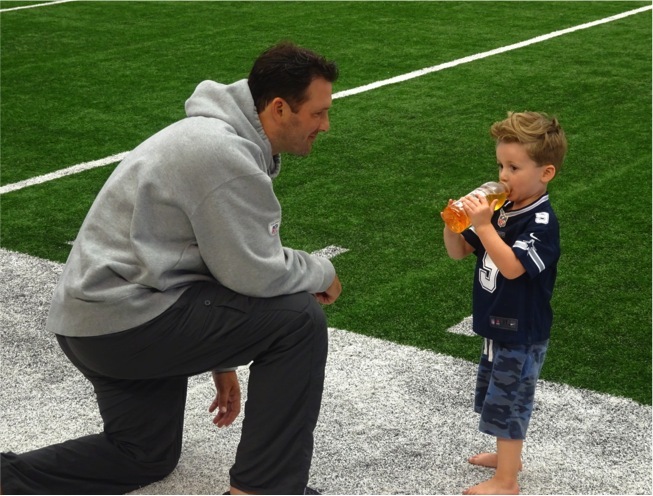 Some of the players and their families gathered on the field after practice and their children caught touchdowns or emulated their Daddy’s as the proud Fathers looked on. I’ve come to enjoy Cowboys Family Day as one of my favorites because who could get tired of watching big powerful men turn into kids as their little ones bounce and run around on a football field. 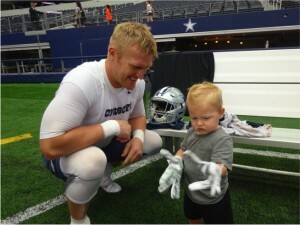 The wonderful moment watching Fullback Tyler Clutts’ son ask for and get Daddy’s gloves to wear was fun. Hawkins with both boys sporting their custom “Daddy” number 9 jerseys. Rivers saw Dad and ran for a hug. Hawkins took a swig of Daddy’s drink. But alas, there was football business to be had before we went on a month long break prior to training camp in Oxnard, California. 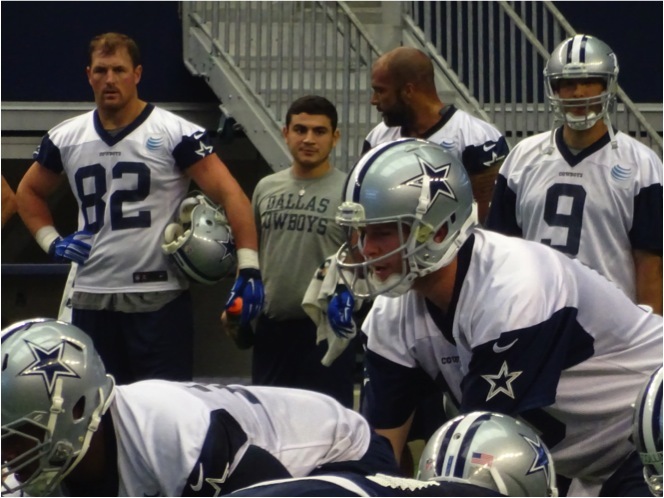 These are my top six observations from day three of Dallas Cowboys mandatory minicamp. Cowboys QB Tony Romo threw the ball for about five minutes when he first entered the field of play on Thursday, but after that QB’s Brandon Weeden and Dustin Vaughan took over. The battle for the backup position is an interesting one. Last season Weeden looked good during his relief appearance when Romo went down with his back injury in week 8, but Brandon struggled against Arizona taking the loss in the following week. QB coach Wade Wilson says that Weeden is the most improved guy on the team, but the quarterback has a battle on his hands as Vaughan looks substantially more comfortable now than he did this time last season. During 7 on 7 drills, Vaughan threw a nice pass out to running back Lance Dunbar in the flat who then cut it up field and ran in for the touchdown. I liked what I saw from Vaughan compared to last season, and I think he might be the more improved of the two QB’s. That’s not to say that he the rookie free agent was bad, it’s just that he did not look as polished to me as veteran G Ron Leary. Collins put in some good work with RT Tyron Smith against Greg Hardy, but La’el was called for a false start and seemed uncomfortable at his unnatural guard position. Collins has a fantastic first step and enormous potential, but it will be interesting to see if he improves through training camp. combine records, but skill I guess I was not aware of was his special teams abilities. During punt coverage drills, Jones was consistently one of the first down the field to make the tackle. I counted at least three occasions where he would have easily crushed the punt returner in a game situation. It’s important to note that this was not a full pad/contact practice, but still Jones impressed with his coverage. Oh yeah, the guy can jump, extremely high. Byron made a number of Michael Jordan hang-in-the-air-for-five-minutes type catches during interception drills. Opposing QB’s are going to learn quickly that it is better to short hop their wide receivers on misses against Jones than to overthrow their target. 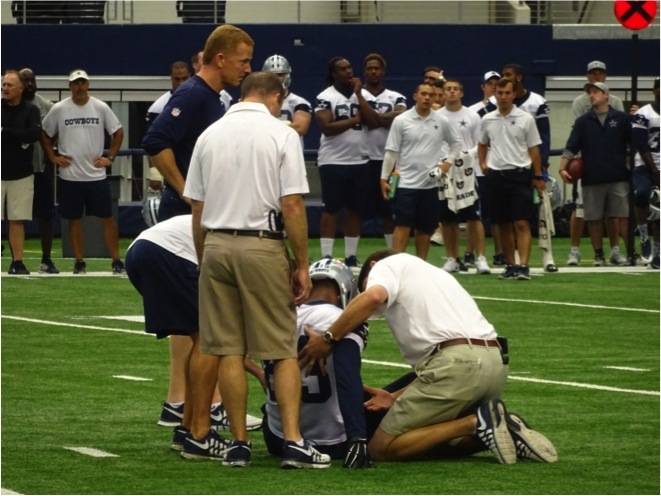 Terrance Williams went down with a left elbow injury roughly 10 minutes before the end of the practice. Coach Dooley said he was being taken back to Valley Ranch for further evaluation and x-rays that came back negative. 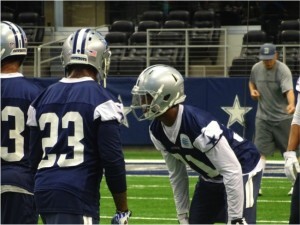 According to Dooley, Williams has stepped up in a leadership position on the field to fill the absence of Dez Bryant. ball and talking with teammates. 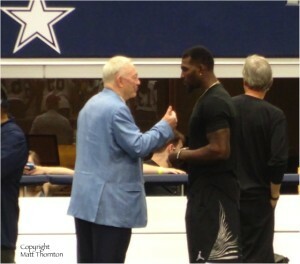 At one point, Jerry Jones walked over to him and the two had roughly a 10-minute conversation. We media types were on the opposite side of the field, and could not hear anything said, but afterwards both men shook hands and walked away. Wide receivers coach Derek Dooley praised Dez and said he likes the WR’s passion for the game. Tight end Jason Witten also said he appreciated that Dez was there. I’m not sure if Jones and Bryant can come to an agreement before July’s deadline, but I do know his teammates and coaches were happy to see Dez on the sidelines. 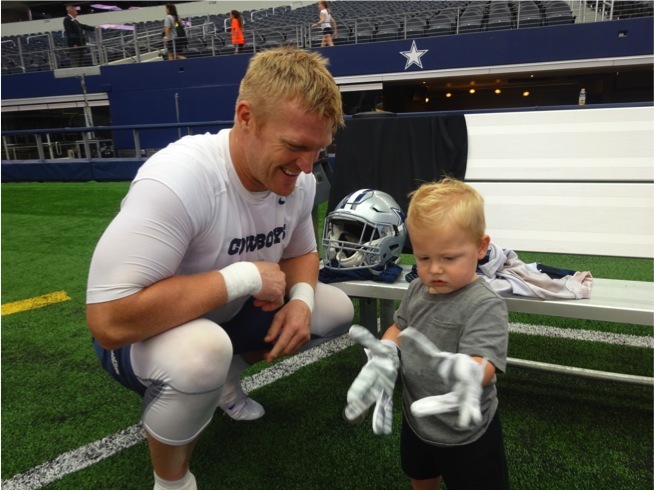 It was a great day out at AT&T Stadium, and it was particularly rewarding to see the players and their families having fun and relaxed. As we enter the long and somewhat painful stretch between now and the start to training camp at the end of July, I wish everyone a safe and happy summer. Consider it a success if the Cowboys win seven games in 2014.